Do you believe in the SI Jinx? You it occurred to me, I used to be superstitious. Good thing I got over it. However, I did notice a prominent NFL quarterback (Tony Romo) that plays for a certain team (Dallas) that is playing their home opener in a certain city (Cleveland) against a certain team (The Browns). 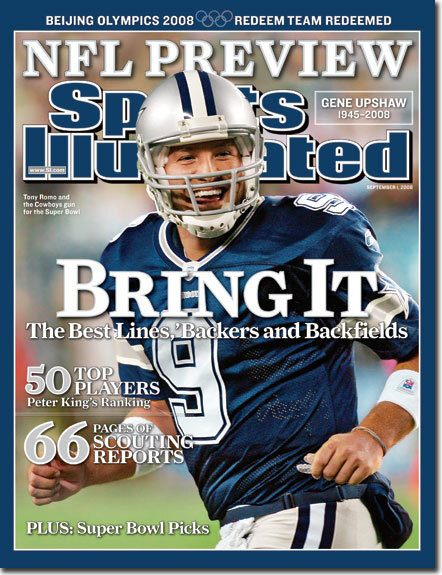 But there were rumors that a certain team (The Browns) would show up on the cover of a certain magazine (SI). To this point I am somewhat relieved, (although not superstitious) that the certain team is not yet on the cover. I have plans to one day purchase a subscription to SI, despite getting some inappropriate issues, if indeed one of the three major teams in a certain city (The Browns, the Cavs or Indians) win the Super Bowl, NBA Championship or World Series, respectively, to get the commerative tee shirt and other commemorative junk. Well, I hope nothing bad happens to Tony Romo, but I do hope their team starts the season 0-1.